The Eugene V. Debs Foundation is saddened to report the passing of Professor J. Robert Constantine, the last surviving founder of the Eugene V. Debs Foundation, who passed away at his home in Austin, Texas, on Thursday, May 25, 2017, at the age of 93. In 1962, he was the member of a small group who raised money and negotiated the purchase of the Debs Home from a local developer, thus saving the home from the wrecking ball. Bob served as Foundation Secretary from 1962 until 1983 and was a long time professor of American History at Indiana State University, retiring in 1989. 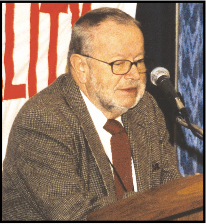 Professor Constantine edited the 3 volume “Letters of Eugene V. Debs”, published by the University of Illinois Press in 1990, and prepared an abridged 1 volume edition, “Gentle Rebel” that was released in 1995. He was also the author of numerous articles. In his role as a founder and the organization’s first secretary, Bob worked tirelessly to restore and preserve the Debs Home, raised funds and built up the foundation’s membership. For more than 20 years, he organized Debs Award dinners, handled the groups correspondence as well as completing numerous administrative functions and doing this all without a salary! Ben Hanford, the 1904 & 1908 Socialist Party Vice Presidential nominee created a fictional character known as “Jimmie Higgins”. It was “Jimmie” that performed the silent, unglamorous, behind the scenes work that allowed the party to achieve its success. Bob Constantine was a scholar, a friend and through his tireless efforts for the Eugene V. Debs Foundation, he was our “Jimmie Higgins”! Thank you Bob and rest in peace. The home and museum dedicated to the memory of Terre Haute’s own Eugene V. Debs (1855-1926) stands in the heart of Indiana State University. I remember the home, when it housed the Theta Chi Fraternity. It is amazing that the beautiful oak woodwork and glassed enclosed bookcases, which frame the fireplace in the parlor are so well-preserved, surviving fraternity party life. 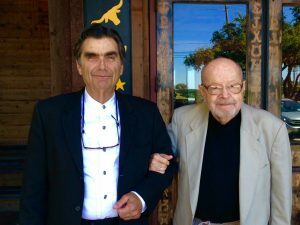 A few days ago, I decided to visit the Debs home after learning that my favorite professor from my ISU years, Dr. J. Robert Constantine, had passed away at 93 in his home in Austin, TX on May 25, 2017. Dr. Constantine taught history; I had him for numerous undergraduate and graduate course, since I majored in history and have my Master’s in American history. 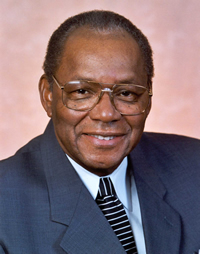 Dr. Constantine retired from ISU in 1989. For a number of years, I lost track of him when he moved to College Station, TX. However, in the late nineties we reconnected, when I visited him during one of my preaching engagements at Texas A&M. I was pleased that he was interested enough in my mission that he came out to campus to listen for about an hour. This began an annual visit with the professor, which continued after he moved to Austin; there we had dinner together whenever I was speaking at UT. Dr. Constantine was the foremost Debs scholar and was the last living founder of the Debs Foundation, which owns the Debs home and museum. I concluded that a visit to the Debs Memorial was a fitting tribute to my late friend and old mentor. One of the bedrooms is dedicated to James Whitcomb Riley; it contains Riley memorabilia, including poems of Riley and correspondence between Riley and Debs, carefully preserved. Riley stayed in the Debs’ home, when visiting Terre Haute. I asked my knowledgeable tour guide about the friendship between the sentimentalist Hoosier Poet, Riley and America’s most renown socialist, Debs. She said, Debs had the ability to “forge friendships” with people with other points of view. On the top floor, the walls are covered with murals painted by Terre Haute artist, the late John Laska, which depicts leading progressives, socialists and communists, including Karl Marx. However, in the midst of the pictures is a dignified portrait of Terre Haute’s leading industrialist and philanthropist, Herman Hulman. Below the portrait is a plaque which reads, HERMAN HULMAN MEMORIAL AUDITORIUM The Gift of His Grandson, Anton Hulman, Jr. 1975. I said to my tour guide, “Isn’t it ironic that the Hulman family, Terre Haute’s most notable capitalists, contributed the money to finance this auditorium with these impressive murals of radicals?” She reminded me that Debs in his twenties had worked for Herman Hulman’s wholesale grocery house for five years. Then again, she reiterated how Debs had a talent for “forging friendships” with men with whom he had political differences and that his views became more radical with the passing of his years. However, there was a mutual respect between Hulman and Debs, until Hulman’s passing in 1913. Earlier during the tour, I had remarked that Dr. Constantine did not admire President Wilson, who had Debs imprisoned for opposing the draft in WWI; he was found guilty of sedition. It was a Republican president, Harding, who commuted Debs’ sentence, which Wilson refused more than once. After Debs’ release, Harding invited Debs to the White House upon receiving him, he said, “Well, I’ve heard so damned much about you, Mr. Debs, that I am now glad to meet you personally.” Debs was not a sour socialist; he had a warm charismatic personality. Evidently, Harding respected Debs for his willingness to go to prison for his convictions. During his imprisonment, Debs made one of his five runs for the presidency on the Socialist Ticket. Even though Dr. Constantine and I were at different ends on the political spectrum, we always were able to enjoy one another’s company in our dinner conversation. Sometimes after the passing of his wife instead of going out, he would fix me a sandwich in his home. Dr. Constantine said more than once, “Jed and I don’t agree on a lot of things but that does not make any difference.” I was proud that he would say that I was the best student he ever had, sometimes he would qualify that and say, “one of the best.” He once said that he admired “my moxy” for standing up for what I believed. We talked some politics and history but mostly about Terre Haute, ISU and mutual friends and acquaintances. When I turned 70, he remarked, “You know you are getting old, when one of your students is 70.” He was 89 then. He said to me, “Call me Bob.” But I never felt comfortable being so familiar, so I addressed him as “Doctor.” I usually would bring up the saving grace of Christ at some point in our conversations; he listened patiently for he was not a particularly religious man; nevertheless, he was a kind man and always a gentleman. Although he was raised a Catholic, he was not practicing. He always allowed me to say grace over our meals and sometimes I would even conclude our visits in prayer. Dr. Constantine in our correspondence referred to me as “old friend.” At my last call to my old friend this past winter, I had my wife, Cindy, with me. The last few years he was in assisted living so we would just visit in his room. His short-term memory was not so good by now but long-term memory was still intact. He always recognized me and my wife. My last picture of him is concluding our visit with prayer. As we all bowed our heads, my wife and I recited the Lord’s prayer, he repeated it with us. The Mr. Hulman, and Mr. Riley connections with Mr. Debs set a good example, that men should not allow different politics from hindering a friendship. Friendship should trump politics. When I walked into the Deb’s memorial, I had to hold back my eyes from a-leakin’ over the passing of my old friend, Dr. Constantine. Yet, I was encouraged by the visit to this interesting and appropriate Terre Haute historical sight. Donations to the Eugene V. Debs Foundation are being accepted in his memory.